Digital caricatures combine the newest technologies with the joy of traditional caricature art. This brings magic of new age caricature to your event. Imagine watching a caricature being drawn live on a display or via projector. Same authentic form of caricature done on a computerized system. The results can instantly be shared on Innstagram, Youtube Facebook or other social media platforms. We can print them on the spot. We send them to your clients. These caricature drawings are done in high resolution. They are created to be used in screen and print media. 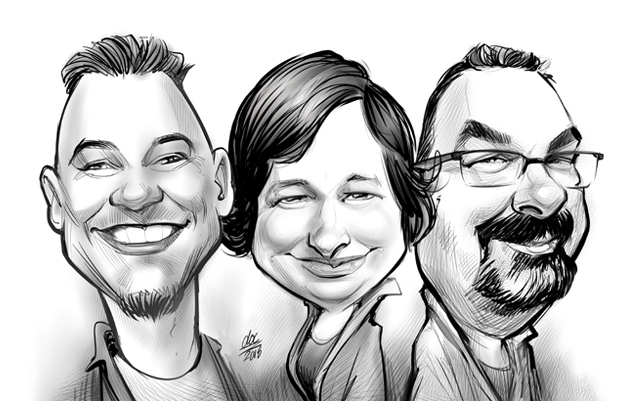 We are the largest and first collective of Professional Digital Caricature artists in Montreal. Since 1991 we have served hundreds of clients throughout Quebec and greater Montreal area.